I really like the puzzle. It’s accessible enough for a Monday and the theme is interesting and multi-layered. That’s not easy to do. We have four theme entries and a revealer. 17a [Extremely inexpensive] is DIRT CHEAP. Earworm alert! 24a [Bottom-up, as a political movement] is GRASS-ROOTS. 45a [Amateurish] is BUSH LEAGUE. 57a [Bars that kids go to?] is the JUNGLE GYM. 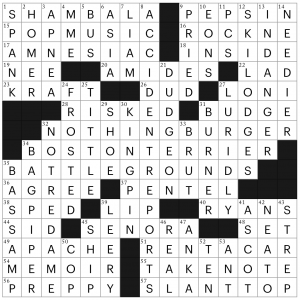 And the revealer: 37a [“Now things are getting interesting” … or a hint to the first words of 17-, 24-, 45-, and 57-Across]: THE PLOT THICKENS. We go from DIRT to GRASS to BUSH to JUNGLE on the same PLOT of land. This gave me a satisfying “aha” moment on a Monday puzzle. Very nice. The fill is quite clean for a puzzle with this much theme material. 6d [___-de-lis] is FLEUR. I have also seen the last word spelled LYS. A Google N-gram tells me that LYS was more common in the 19th century; the two spellings have been used roughly equally since 1900, except for the 1940s when LYS pulled ahead again. Thanks to Alex and Will for resisting the temptation to cross-reference ALOHA and KAUAI. 34d [Was a maverick] is WENT ROGUE. Ah, for the halcyon days of 2008, when we thought Sarah Palin was the worst thing that could happen to politics. UANDI looks ridiculous. I got it from crossings. The clue is [We, on a candy heart], so it’s actually U AND I. Not my favorite entry in the puzzle. What I didn’t know before I did this puzzle: that MT IDA was a sacred peak. I knew it was a Greek peak, but that was all. ZB is back and she brings us a super-smooth Monday grid. I didn’t know what was going on until I hit the revealer at 60a [All the time, as well as a hint to the abbreviations hidden in the starred answers]: AM/PM. Each answer has that letter string hidden inside. A nice themeset. I especially like the SWAMP MONSTER. STAMP MACHINE feels the most iffy; I’m not sure I’ve seen one in many a year, but they must still have them (mustn’t they?). 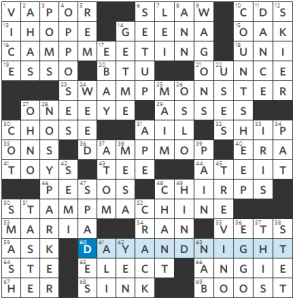 I generally prefer that there be a reason behind the puzzle—in this case, a reason why AMPM is hiding out inside our theme answers. But on a Monday, I’m a little more lenient on that front. And the given revealer is well-chosen. The long fill is nice, as per ZB’s usual: COUNT SHEEP and NOSY PARKER make for great pillars in the grid. And the sound effects almost had me feeling like I was reading a Batman comic: SMASH! CRACK! CHIRPS! This is what you want in a Monday grid: a gettable theme, colorful long fill entries, clean supporting fill, and straightforward (but not boring) clues. This is why it’s so tough to make good Monday puzzles, and yet Zhouqin makes it look so easy. 3.75 stars. 9D: TEA PARTY [Boston tax protest of 1773] – Thankfully, this wasn’t clued with respect to the more recent political movement. 39D: LA LA LAND [2016 film wrongly announced as Best Picture] – You’re really missing out if you haven’t seen the real winner, “Moonlight”. I really liked this theme and it certainly did not DEPRESS me or give me the EHS! The last word of each themer can be paired with LINE to form a compound word or phrase: headline, streamline, party line, underline, land line. Not only are all the theme entries themselves very common and in-the-language, so are the -line words or phrases. And, the grid is mostly clean for such a theme-dense puzzle (though AANDE ERISA LIA ASO felt a bit dodgy). This might be one of my favorite LAT Monday puzzles in a while! We have some nice female representation in the grid today with EVE, Kate WINSLET, STES, Mia HAMM, and DIONNE Warwick. Did you know that Warwick is “second only to Aretha Franklin as the most-charted female vocalist of all time, with 56 of her singles making the Billboard Hot 100 between 1962 and 1998, and 80 singles making all Billboard charts combined”? Wow! My only major ding of this puzzle: [Beachgoer’s color] is only TAN for some people. Clues like this assume the subject and solver to be white, which only marginalizes people of color who might be solving. Happy Monday, all! 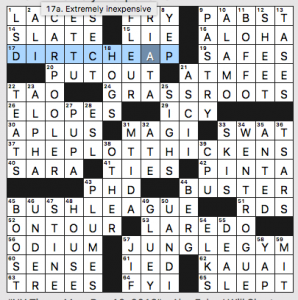 Let’s get this bread solve this Patrick Berry New Yorker crossword! I know my POP MUSIC pretty well, but Three Dog Night’s “SHAMBALA” isn’t on my radar (and won’t get written up in Stereogum’s ongoing Number Ones series, since it only peaked at #3 on the charts). What was on my radar, though, is that the BOSTON TERRIER is nicknamed “The American Gentleman”. If my apartment building allowed pets, I’d already have one napping on my sofa. There was a lot else to love in the grid on this one. 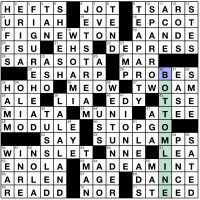 Bolstering either side of BOSTON TERRIER were NOTHINGBURGER (a phrase I have only seen in crosswords and never heard spoken aloud) and BATTLEGROUNDS, and ACCIDENT REPORTS (clued as “Pile resulting from a pileup”) did a great job of anchoring the down fill. I had somehow misremembered RENNET as the enzyme in cheese, not PEPSIN, and my brain couldn’t remember that J. Press is PREPPY without a little help from some of the crossings. “Like nineties hairstyling tips?” for FROSTED made me TITTLE titter while solving. 4.25/5 stars – solid fill and hilarious cluing. 19a [Israel’s economic center] TEL AVIV-JAFFA–At first I was deterred by TEL AVIV’s not having the right number of letters. I’d gotten T from 1d CLOT and V from 5d ALIVE . I then was aided by F’s in 9d NERFS and 10d TGIF, which led to the thought “Well, it could be Tel Aviv-something F-F-A.” Jaffa felt familiar somehow, and it fit. 36a [It operates after a running start] MANUAL TREADMILL–From 24d-26d, I got ILL (no pun intended), then guessed correctly at the rest. Very nice clue! 49a [Joint resolution proposal?] immediately put me in mind of marijuana and jail. PRISON REFORM came quickly after I tearfully wrote MERL in at 54d [He appeared alongside Will in “The Simpsons” episode “Homer and Lisa Exchange Cross Words”] (RIP, Merl Reagle, 1950-2015). 58a [Like many an Internet purchase] TAX-FREE–In practice, yeah, and legally so until June of this year when the U.S. Supreme Court ruled, in South Dakota v. Wayfair, that somebody has to pay the sales tax–if the seller doesn’t collect it and remit it to the appropriate state, then the state can go after the buyer. Caveat Cruciverbalist! 20d [Tough guy of film] JOHN RAMBO reminded me that Sylvester Stallone’s iconic character did have a first name. Other good ILSAs include PIGPENS, SEEDPOD, BEDROLL, and FOG ALARM, all adeptly clued. 4 stars. Quite entertaining! Another great effort by BEQ! This entry was posted in Daily Puzzles and tagged Alex Eylar, Brendan Emmett Quigley, C.C. Burnikel, Frank Virzi, Patrick Berry, Zhouqin Burnikel. Bookmark the permalink. NYT: I agree, Jenni. It’s remarkably textured for a Monday. Well done! I can’t get Judge Vic’s post of today’s BEQ to load. It appears to be done. Any clues? Thanks, Karen. How nice to know someone’s looking for it! New Yorker: I also had RENNET first at 9A. According to Wikepedia, rennet is a mix of enzymes obtained from the stomachs of ruminants (ewww) and is indeed used in cheesemaking. Pepsin is one of those enzymes, but it doesn’t appear to be particularly important in the cheese biz. Chymosin is the one that actually curdles milk. Pepsin has some uses in the food industry (per Wikipedia, again) but cheesemaking is not one of them. It also has some technical uses in preparing other molecules used in various biomedical assays. So the clue for PEPSIN seems a bit off to me, is what I’m saying. Very nice crossword, though not as esoteric as some New Yorker puzzles. Ben, you weren’t wrong. Rennet *is* an enzyme used to make cheese. According to Wikipedia, pepsin is one component of rennet. So, both of those are legit answers. So a weird thing happened just now: I had edited the above post, and upon clicking Save, it returned to my original unedited post, 21 seconds left, and my name was “undefined”, which also, was a link to an undefined page. I don’t know how that happened, but I have had some strange experiences with Edge since my computer updated a couple of days ago. To my post, I had added that although I had heard of pepsin, I had always associated it with Pepsi somehow, but they don’t appear to be related. Not really important, just good to learn new stuff. I enjoyed the theme of today’s NYT. I have a nit, though: 31a [New Testament trio] MAGI. In Matthew 2 we’re told of “wise men from the East” going to Jerusalem in search of “the child who has been born king of the Jews.” King Herod sends them to Bethlehem, where they find Jesus. A tradition developed that there were three visitors–because Matthew named their gifts: gold, frankincense, and myrrh. No mention is made in the Bible, however, as to how many travelers were in this group. Happy holidays! TNY: I remember watching John Harwood on CNBC characterizing the contretemps involving Debbie Wasserman Schultz as a NOTHING BURGER which turned out to be true since she’s chief of staff for President Hill—oh, wait.